Home > Shop by Brand > Porter Cable 7424 XP Car Polisher & Kits > Porter Cable 7424xp Marine 31 Boat Polish & Wax Kit Free Bonus! The easy way to keep your boat looking great! 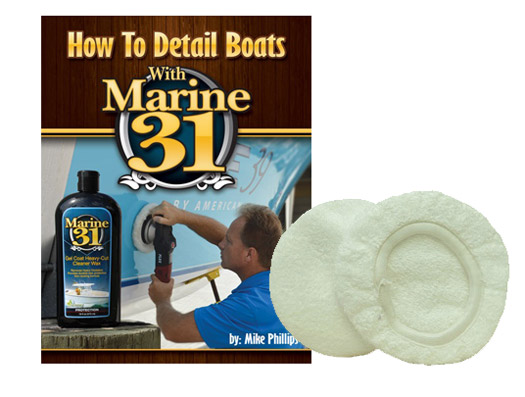 For a Limited Time receive Mike Phillips' How To Detail Boats With Marine 31 and 2 6.5 Microfiber Bonnets free with the purchase of this kit! The Porter Cable 7242 XP Marine 31 Boat Polish & Wax Kit makes it easy to keep your boat looking great. Marine 31's easy-to-use, harbor-safe products make it easy to create and maintain a high-gloss shine on your boat's gel coat -finished or painted. Instead of spending hours rubbing your gel coat in search for that shine that radiates across the bay, let the dual orbital and spinning action of the Porter Cable 7424XP do the work for you. Your dock mates will think you spent days shining your gel coat. You'll be too busy piloting your boat on the seas to let them know the Porter Cable 7242 XP Marine 31 Boat Polish & Wax Kit did the work for you! The Porter Cable 7424XP Dual Action Polisher provides a safe, random orbital motion that polishes and applies wax without creating swirls! The Porter Cable 7424XP DA Polisher is suited for detailers of all levels of experience and skill. The PC delivers smooth results with none of the risk of high powered rotary buffers. Random orbit, swirl-free polishing action levels a wide range of imperfections, like swirls, scratches, and oxidation, and it restores the shine to paint. Numerous types of pads are available for this machine to do everything from swirl removal to fine buffing. The random orbit keeps the pad moving to reduce heat buildup. Spiral/bevel gears are long-wearing.100% ball and roller bearing construction ensure years of trouble-free performance. The Dual Action Flexible 5 inch Backing Plate will last through countless, rigorous uses without falling apart or becoming unbalanced. Balancing is essential when it comes to polishers because an unbalanced plate will bounce, leaving an uneven finish. The reinforced inner construction uses steel struts molded into the center hub to give the plate stability and maintain an even surface for your pad. Marine 31 Gel Coat Carnauba Wax + Sealant will impart a highly protective, high-gloss finish on your boat's gel coat and metal surfaces. Marine 31 Gel Coat Carnauba Wax + Sealant was formulated in the nautical environment of south Florida. It is a blend of purified carnauba wax and crystalline polymers designed to create a blistering shine that radiates across the water and lets other sea travelers know that you take pride in your ship. 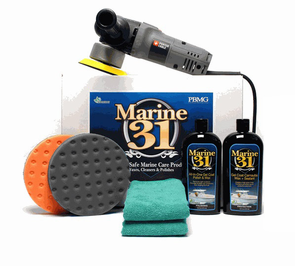 Marine 31 Gel Coat Carnauba Wax + Sealant is easy to apply and effortless to remove. The Lake Country CCS 6.5 Inch Orange Light Cutting Foam Pad is a firm, high density foam that provides enough polishing power to remove light oxidation and haze from gel coat finishes. Use this pad with Marine 31 All-In-One Gel Coat Polish & Wax to lightly polish your gel coat and keep it shining brilliantly. The Lake Country CCS 6.5 Inch Black Finishing Pad features a soft material which is perfect for applying Marine 31 Gel Coat Carnauba Wax + Sealant in an uniform, even coat. These all-purpose microfiber detailing clothes are perfect for a number of different detailing tasks. You can use them for washing, removing polishes or waxes as well as a any number of interior or exterior tasks. Color may vary. A total retail value of $253.92 You save $53.93!